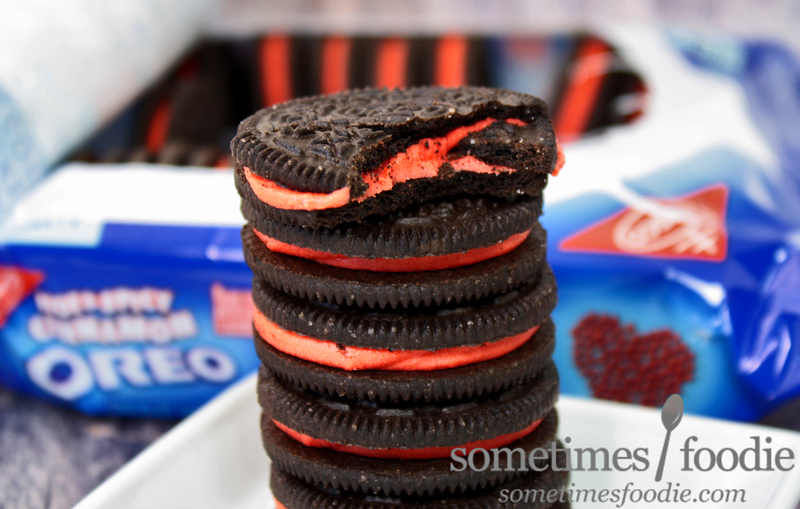 Sometimes Foodie: Sizzlin' Cinnamon Oreos? 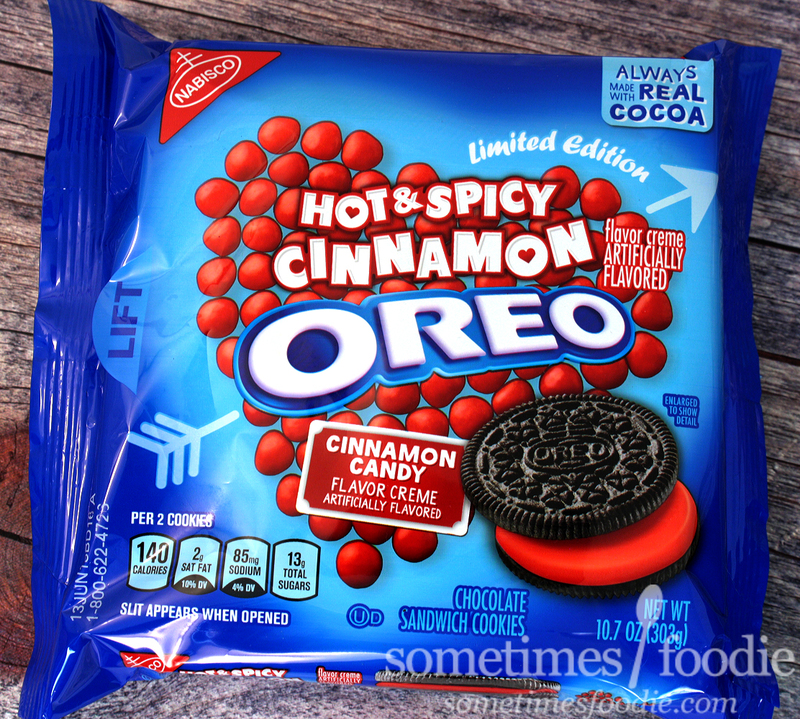 This combo may sound strange to some, but I'm no stranger to cinnamon Red Hot candy in cookies. Whenever Christmas rolled around my mom would make a bunch of cookies, and one of my favorites was her almond press-cookies with cinnamon red-hot candies mixed in. When baked, they melted into stained-glass-looking ornaments and added a wonderful crunch as well as cinnamon-y flavor. That being said, I'm kind of shocked that there aren't actual candies mixed into the cream for added texture. Part of the cinnamon-candy experience is the texture...but I'm excited for these nonetheless. I twisted the cookie apart and tried the creme on it's own. Thank goodness, it doesn't taste as Big-Red-like as they smell. The creme filling is neon red, but it tastes mild and creamy. 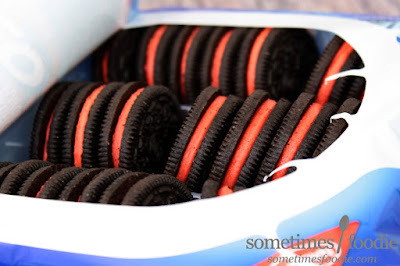 Actually, it's very similar to Cinnamon Bun Oreos. The cinnamon flavoring is slightly more intense than normal, but it's far from "Hot & Spicy." The color makes these look intense, but I would say they're no-more-cinnamony than your typical cinnamon baked good. Like, a muffin, or coffee cake. What about the chocolate cookie combo? Surprisingly, when eaten together, the chocolate cookie and cinnamon combo isn't half bad! The chocolate mellows out the cinnamon even more, making this a slightly more cocoa-infused cinnamon bun, and it pairs nicely with a glass of milk. I'm shocked that this isn't as intense as the packaging, and color, make it seem, and some crunchy candy inclusions would have been nice, but in the end, it works! 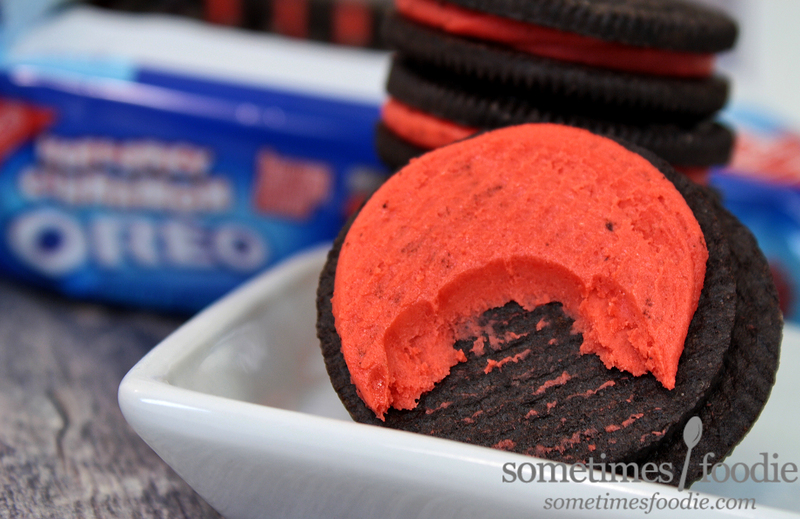 It's a very edible cookie, and far better than you'd think. I was expecting these to be really bad, but I ate the whole package in like 4 days. I thought the cinnamon/chocolate combo would be gross, but it played really well. I liked these better than the Nutella rip off they did, and Nutella is my favorite. I was skeptical when these were announced because I wasn’t sure I was going to like them and I thought the cinnamon might clash. That being said, I was definitely very surprised when I bought and tried them on Sunday. They really executed them so well.